Barry puts our new Elementary 01 darts under the magnifying glass! Once again a big thank you to Paul from the Darts Performance Centre for very kindly sending me this set for review. The darts I am reviewing are the recently released DPC Elementary 01 darts, with this version being 26g. These darts have been released by the DPC as being targeted at those players looking for a high quality, yet affordable dart to complement their Performance dart series. Let's see if this is something they have managed to achieve. This 01 model comes in 24g and 26g and are 90% tungsten. Alongside this 01 model they have also released the 02 model that comes in 22g and 24g and are 90% tungsten with this model being a standard ring grip dart with a tapered nose. Check them out via the above link and check the review of them on the DPC blog. Both models retail for what seems a bargain price at £19.95 for 90% tungsten darts. Let's check out whether this is really value for money as we investigate the darts in depth. The darts come in the usual DPC clamshell style packaging with the nicely designed paper inserts with the detail on the principles behind the dart on the rear insert. Inside the outer packaging you get a hard plastic case that contains the 3 darts in a point protector, a set of medium length red nylon stems and a set of standard size black and red R4X flights. The darts come fitted with 26mm (protruding) plain silver points as standard. 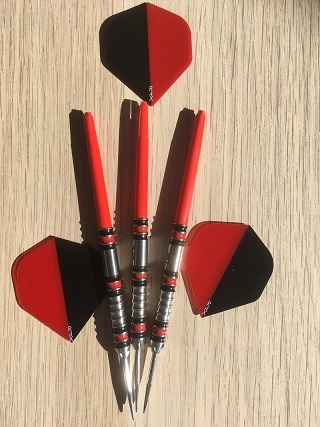 The darts themselves are certainly eyecatching with the painted black and red rings at the front, middle and rear of the dart and also with the little diamond milled outcuts on the nose of the barrel adding to the aesthetics of the design. I wouldn't say these outcuts offer any grip; at least I couldn't feel them under my finger, but others may be able to and use them as reference, for me they purely added to the look of the dart and add that little something extra, very nice. 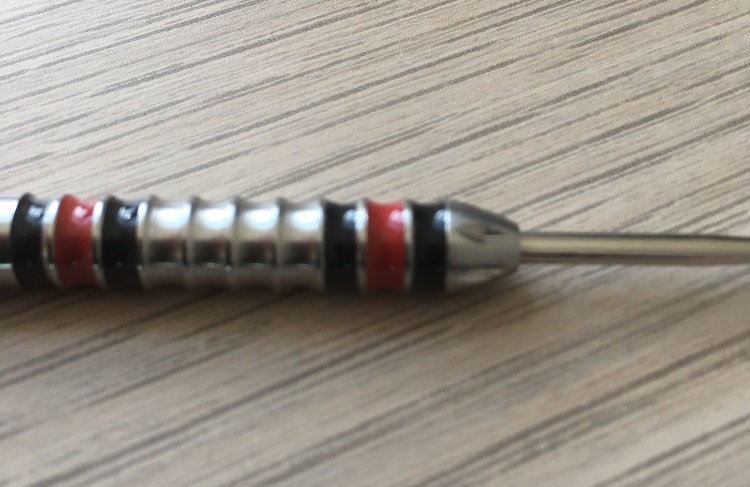 First impressions on the darts are that they are a striking design with the colour combination, the diamond milled outcuts and the shape of the main grip. The main grip on the barrel is a series of thin cut rings, with a wide concave groove in between. There are 10 of these grooves on the front section and 3 on the rear. The grip offers a high level of grip, but without being sticky on release due to the concave nature of the grooves. It is not a grip I have tried before and it did take a little getting used to, but after a while I found it to be very secure and offered good purchase for the release. The pictures show the grip and barrel in more detail. Let's see how these darts match up with the provided weight and dimensions. Therefore, what we have are darts that are perfectly weight matched and whose dimensions match with those stated on the DPC website. £19.95 - surely this is a great bargain for a 90% tungsten dart produced to this quality. I do have aminor annoyance. I have to point out - it wouldn't be a complete review without talking about some negatives. 1. The paint work on the darts could be better. It is a little shabby in places. This is very minor as it doesn't affect the performance of the dart whatsoever and the paint will get chipped with usage. On to throwing the dart. For me the supplied setup made the overall length too long and I experienced fishtailing through the air. I changed out the medium stems for some tweenie pro grips and these made a big difference. 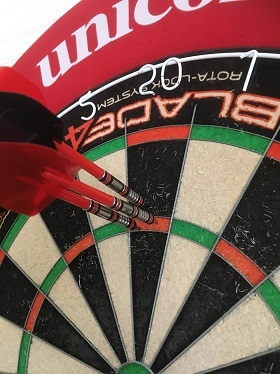 A nice smooth flight and the darts felt so much better. The grip was secure and I felt like I could throw them with confidence that they would never slip or stick. In conclusion, this dart is a highly grippy, superbly machined and very attractive dart. It would be considered to be on the long side at 54mm, but there are a lot of people that like this length of dart and this is one to be considered if you are of those people. The dart itself has grip all over apart from the smooth band towards the rear. 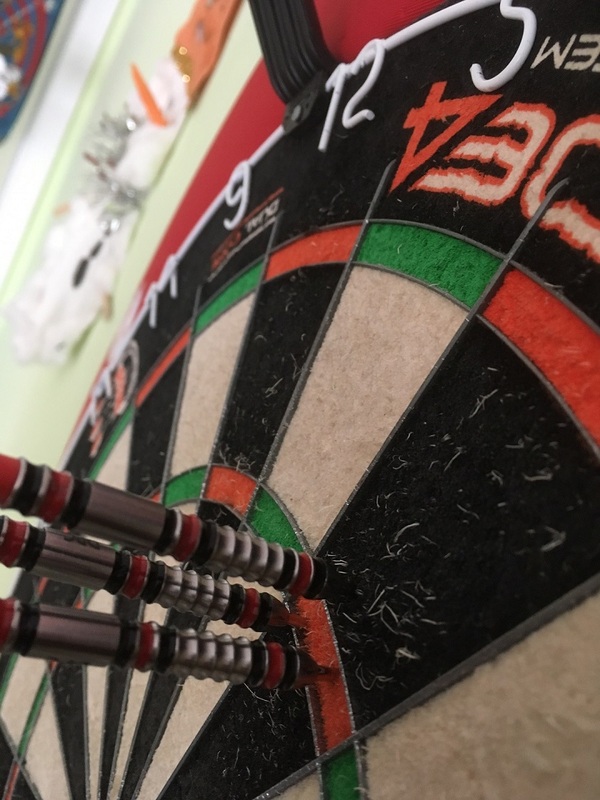 If you happen to grip on it then you lose out on the main feature grip of the dart, however for others it provides a good datum point for their grip. I will be considering these a bit more over the summer and may be in the market for a set of the 24g ones, only time will tell. I would highly recommend these darts and can state that the DPC have definitely met their goal with these darts.